Lemons are a citrus fruit that originates from Southeast Asia. 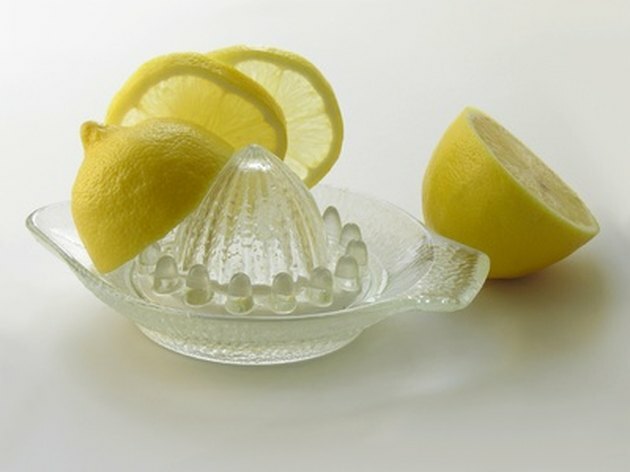 In addition to eating lemons, some people use lemon juice as a way to treat health conditions. These fruits contain many nutrients, including vitamin C, an antioxidant that may provide health benefits, including potential protection for your eyes. Talk with your doctor about the possible eye benefits and risks of using lemon juice, and she will help you determine if lemons are appropriate for you. Lemon juice may have potential benefits in preventing certain microorganisms, such as fungi and viruses. In theory, this could help some types of eye infections. Some people may moisten a cloth or cotton ball with lemon and dab this on their eyelids. However, lemons contain citric acid, and applying lemon juice directly to your eyes may cause burning, stinging, redness and general irritation. As such, direct application to your eyes may not offer the best protection or treatment for eye infections. Drinking lemon juice or eating lemons can provide you with a variety of nutrients, but vitamin C is one of the most abundant in lemons. Vitamin C is an antioxidant that may help prevent certain types of eye conditions, such as cataracts and macular degeneration. Cataracts cloud the natural lens inside your eye, resulting in blurry vision that worsens over time. Macular degeneration is a condition that damages the macula, an area of tissue on the back of your eye. This disease will result in permanent changes to your central vision and may lead to blindness. Lemons alone cannot prevent eye disease. In addition to this fruit, your doctor may recommend that you add other sources of vitamin C to your diet. These sources may include other citrus fruits, such as oranges and grapefruits. You can also choose foods such as spinach, strawberries, tomatoes and bananas. If you cannot reach your intake needs through diet, your doctor may recommend that you take a daily supplement to ensure that you have an adequate intake. Despite the potential benefits of lemons in helping eye infections, you should avoid putting the juice in your eyes. If lemon juice does come in contact with the tissues on the surface of your eye and you experience discomfort or vision changes, flush your eyes with water, saline solution or artificial tears. You should contact your doctor, and if you continue to experience symptoms of a reaction, your doctor may have you come into her office for an examination.